A festive front door can be embellished with a miniature wreath and Christmas cutouts. Try adapting the design by adding your own details and decorations. For the door background, cut a piece of card 21cm x 18cm. Fold it in half to make a tall folded rectangle 21cm x 9cm. For the door panels, cut 4 card rectangles using a darker shade of the main door colour; 10cm x 3cm for the 2 top panels and 6cm x 3cm for the 2 lower panels, stick them onto the background leaving a 2.5cm gap in the middle for the letterbox. Cut 4 slightly smaller card panels in the same colour as the background then stick them onto over the larger panels. 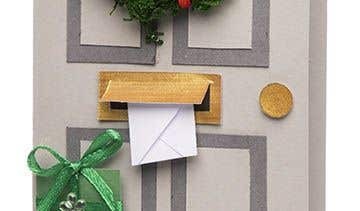 For the letterbox and door handle, paint a small piece of white card with gold paint. When the paint is dry, cut out a rectangle 1.5cm x 4 cm for the letterbox and a small circle for the handle. Cut a flap in the letterbox so it opens. 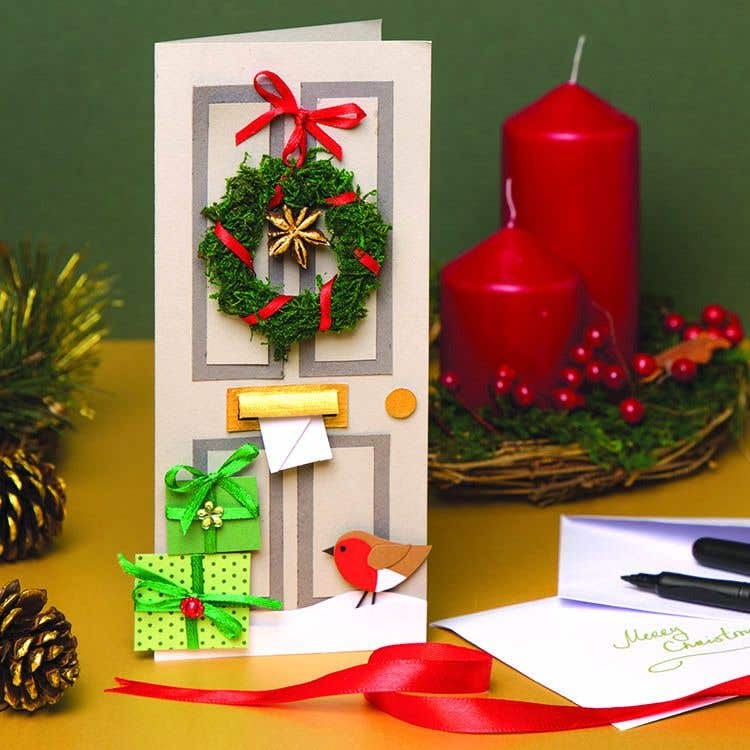 Glue a small dark coloured card rectangle to cover the back of the letterbox hole, then glue it onto the door. For the wreath, cut a card circle 6cm in diameter then cut a smaller 4cm diameter circle in the middle, leaving a hole. The easiest way to do this is to cut in from the edge, cut out the smaller circle then tape over the join. 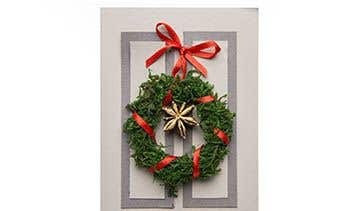 Cover the card wreath with glue then press some dried moss over the top until it is covered then trim around the edge with scissors to make a neat shape. Tie a piece of thin ribbon around the wreath then tie the ends into to a bow. For the presents, cut out coloured card squares, wrap small pieces of thin ribbon around the sides, tape down on the back, then tie bows to the front. 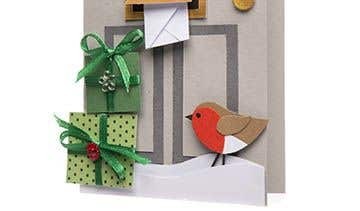 For the robin, cut out a small card shape for the robin from light brown card, with small red and white pieces glued on top. Glue a small beak and 2 thin legs onto the back of the body. Add an eye with a black pen. For the snow, cut 2 curved white card strips to fit across the bottom of the card. Glue them in position with the robing] and presents. For the Christmas card, cut a 2cm x 3cm card rectangle then place it in the middle of a 6cm x 7cm piece of thin paper. Cut the 4 sides of the paper into triangular points then fold them over the card into an envelope. Stick down the top flap, or if you prefer keep this open so the card can be taken out with a message inside. With the door background folded out flat, open the letterbox flap and carefully cut along the top. Push the envelope through the slot. Glue the wreath onto the door with a painted star anise in the middle. Leave to dry. Using a dark colour for the card wreath will conceal any gaps in the moss.